Remember when you were a child and you had one of those wonderful weekends outside the city when your parents took you to the forest, near a creek or by a poppy field; and you had no game boy nor a cell phone and just played with the things that surrounded you there? Were you one of those kids who loved bugs and little animals? Here in Barcelona it’s easy to find them in the City Markets, usually at the chicken market shops. You should always ask if they have been fasting, if so… they will be ready for the casserole! No need to go hunting them in the fields and forests ;D. All my family loves them and this huge casserole gets empty in no time. A good trick to cook them and to enhance their flavour: I have recently discovered that they are much more tasty if they are cooked the way I tell you in the recipe instead of having them boiled. Give it a try. 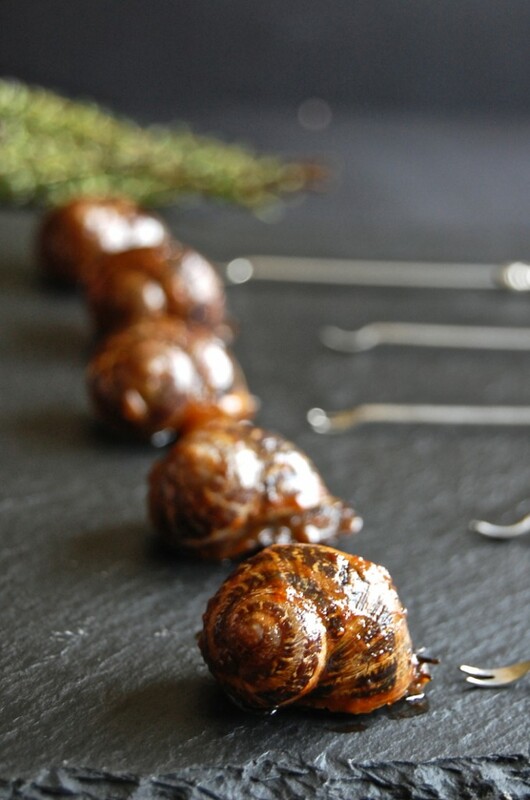 Ingredients for 4 servings: 1 kilo of live snails, 5 slices of fresh bacon, 3 medium onions, 4 garlic cloves, 6 tablespoons of fried tomato, olive oil, herbs: thyme, rosemary, half a teaspoon of fennel seeds. 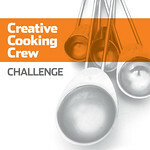 3 tinny chili peppers, 1 teaspoon of black and white pepper, and salt. Clean the snails thoroughly. See how here. Prepare a big casserole, pour enough olive oil to cover the surface and when hot add the bacon cut in stripes. When it goldens up, reserve the bacon in a plate and let the casserole and the oil cool down. When it's completely cold place the snails inside and cover with a lid. Turn heat on. Keep it to minimum until all snails are outside their shells. Raise the temperature little by little until they get cooked and die with their bodies outside the shell (this way it's easier to eat them with a toothpick). Take the lid off and cook them with their own dribble. It will take 8 to 10 minutes aprox. or until the dribble disappears. Add some salt. Reserve. In a big sauce pan, start the sofrito with the diced onion, when transparent, add the chili and the pepper. Add the garlic cut in small dices, let cook for 3 minutes and add the tomato. Cook for another 2 minutes. 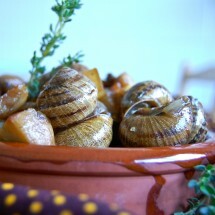 Add the bacon, the snails and the herbs (just some branches), mix well and pour enough water to half cover the snails. Simmer for 45 minutes. Stir from time to time. If the sauce gets to thick add a bit more of water. I love snails. Have had them in Spain and Greece, but unfortunately cannot find anywhere in the US. I would love to try this recipe. It looks so good! Linda: I’m in Indiana and I’m eating snails right now. They’re available all over the web. Have you tried searching for escargot? 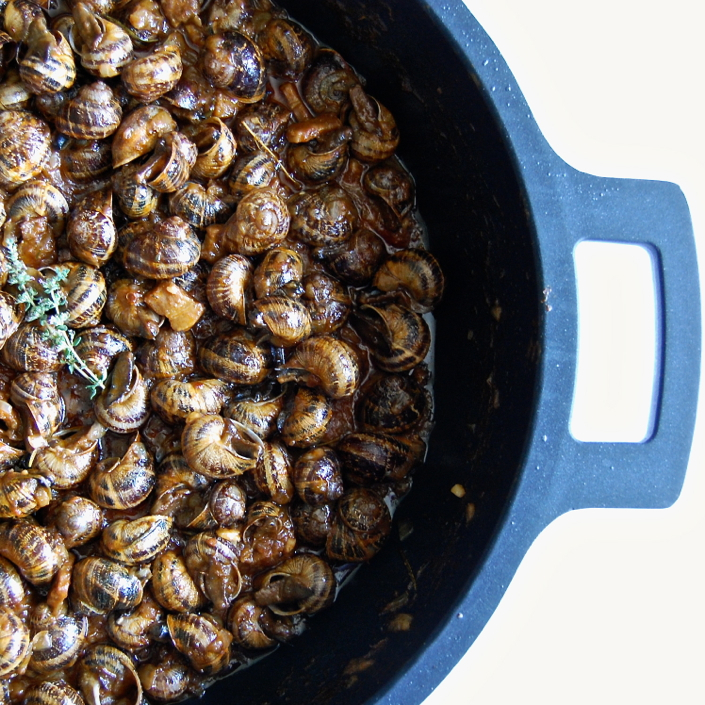 The canned & pre-cooked variety may not always be the most preferable way to enjoy snails, but for most Americans including myself, it’s the only feasible option. A big fan of everything spicy myself, this is definitely on my list to do. Love the recipe ! 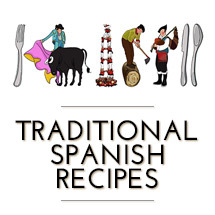 Yo quiero está receta mucho porque tiene mucho ingredientes cómo caracoles (mi favorito), frutas, y alguno hierbas. También, este receta es muy simplemente y es muy rápidamente. Gracias para pone en el sitio de web. 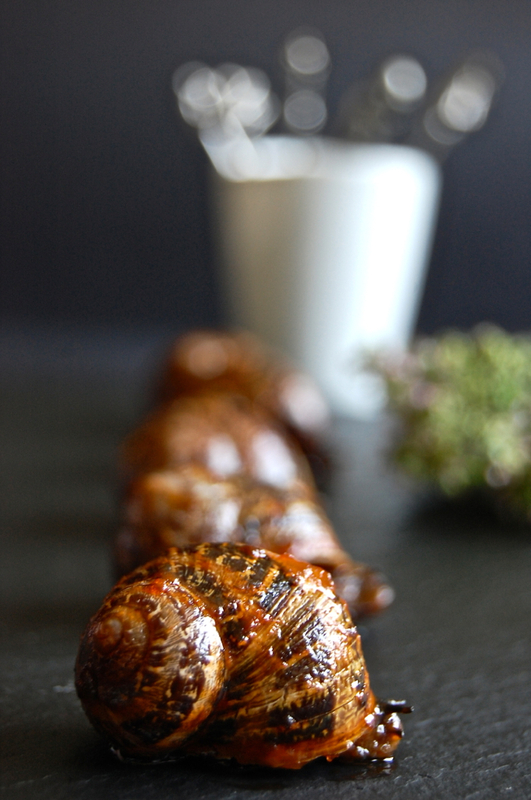 This recipe is simple but very original, I love snails too ! 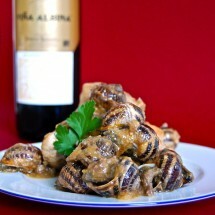 Snails with Bacon and Mushrooms. 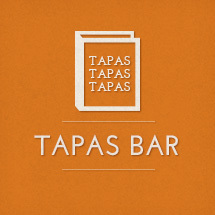 A Fall’s tapa!